Although the beers so far in this collection have been at least wintery in nature – mostly dark and often strong – this is the first genuinely seasonal beer. It’s become a bit of a Christmas staple for me, not because it’s the most incredible beer ever made but because its arrival marks the beginning of the festive season. 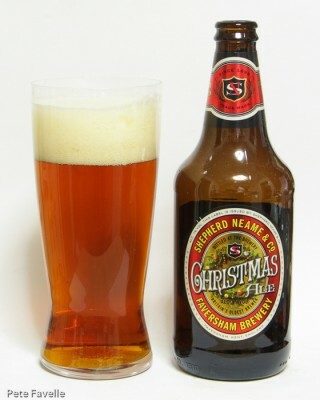 Christmas Ale is exactly what it says on the bottle; Christmas distilled into beer form. It’s a dark amber coloured 7.0% ABV beer, with a deep fluffy head on it. The aroma is sweet toffee with a little mulled spice, and just a touch of cereal in the background. In the mouth it’s rich with sweet red fruit, more subtle spice and a touch of pepper in the background. The bitterness builds up to an almost sharp finish, giving a slightly acidic kick. It’s still a nice beer, but it’s not as magical as it is in my memory – I’m not sure if that’s down to the beer or my taste, though. It’s still worth 3.5 stars though.